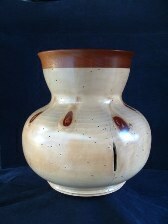 An Art Gallery of Turned Bowls, Urns, Forms and other Vessels! Hello, and welcome to The Art Gallery. 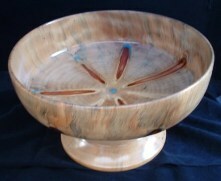 My name is Steve Parker and I am the artist that has created these woodturning art forms and designs. 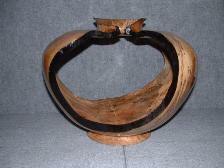 I hope you take a few minutes to browse through the gallery to view my turned art. Every piece is one-of-a-kind as no two pieces of wood are exactly the same in design or shape. Every knot, groove, line and even hole is naturally found in the wood, giving it character and originality. 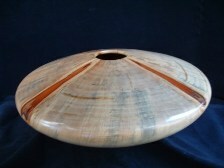 Whether you find some woodturning art that you would like to purchase or you are just looking, I hope that you enjoy seeing some of my turned art as much as I enjoy creating it. 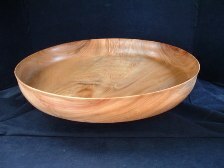 Here is a picture of a large Rosewood Bowl that contains both heartwood and sapwood creating a beautiful complimentary color scheme. 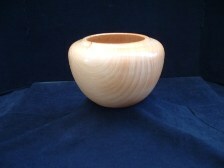 For added flare and design, you can make a footed bowl. If you really want to get creative, you can use two different types of wood creating a more dramatic look. area where the branches grew. 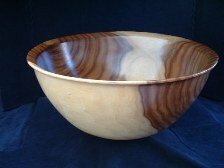 One of our favorite pieces, this 18" diameter Camphor Double Hollow Form provided many challenges in the creation process. Note the split at the rim; this could have developed into a disastrous situation quickly as the piece could have exploded while turning. Norfolk Island Pine has turned out to be one of the most highly demanded types of wood by our customers. 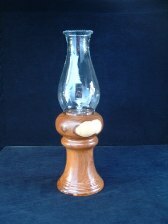 Finished pieces sell quickly and are hard to keep stocked. 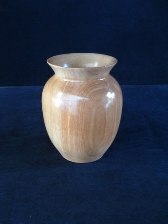 Return to Woodturning Blanks 4 U Home Page.